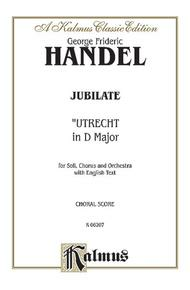 Utrecht Te Deum and Jubilate (1713) (SATB or SSAATTBB with SAAB Soli (Orch.) (English Language Edition)). Composed by George Frideric Handel (1685-1759). Choir Sacred. SATB choir. Choral (Sacred); Choral Worship Cantata; Larger Works; Masterworks; Worship Resources. Kalmus Edition. Baroque; Masterwork; Sacred. Book. 44 pages. Published by Kalmus Classic Edition (AP.K06207).ISBN 076924467X. Baroque; Masterwork; Sacred.